I was going to call this post: "Old People Dying, Round 3" but realized that sounded a bit too... callous? direct? slightly deranged? I am actually none of these things (well, maybe the deranged label fits a bit). I am just... weary, resigned, engaging in a little gallows humor to lighten the load; sick of the dying and the caring for the dying, which seems to endlessly go on and on and on this year. So, here we go again... and no, thank goodness, it is NOT my mother. That much I could not take. If it were my Mom this time I would not be blogging, I would be lying curled up in a fetal position on the floor blubbering away. It is, however, my mother's (80 year-old) baby sister, my Aunt Marilyn. Haven't heard of her? Not surprising, no one has. My children have never heard of her, let alone met her. My husband has heard of her, but again, they have never met. I myself have not seen my Aunt in 8? 10? a dozen years? Really, it was some time ago, I have lost the count, and then for quite a number of years we lost my Aunt. And how and why could a family member get so lost? Well, you see, for as long as I can remember Aunt Marilyn has been lost to herself, too, in one way or another. Lost how? Well, let's just say that when my cousins and I refer to her as "crazy Aunt Marilyn" we don't mean wild and fun. And we're not being cruel, just realistic. Aunt Marilyn is deeply mentally ill, and has been for as long as we have known her. Crazy / mentally ill how? Good question. Aunt Marilyn has had so many diagnoses in her long life, but the ones that seem to stick are some combination of severe bi-polar and paranoid schizophrenia. She lost the family gene pool when it comes to brain chemistry. My grandfather, her father, suffered in much the same way at the end of his life, the last 10 years of which he spent in a state mental institution. At the time psychiatry and diagnosis were not what they are now. He was labeled with "severe depression due to hardening of the arteries", drugged up to the eyeballs, and died a ragged lonely man when I was seven. For Marilyn, it's been a struggle most all of her life. 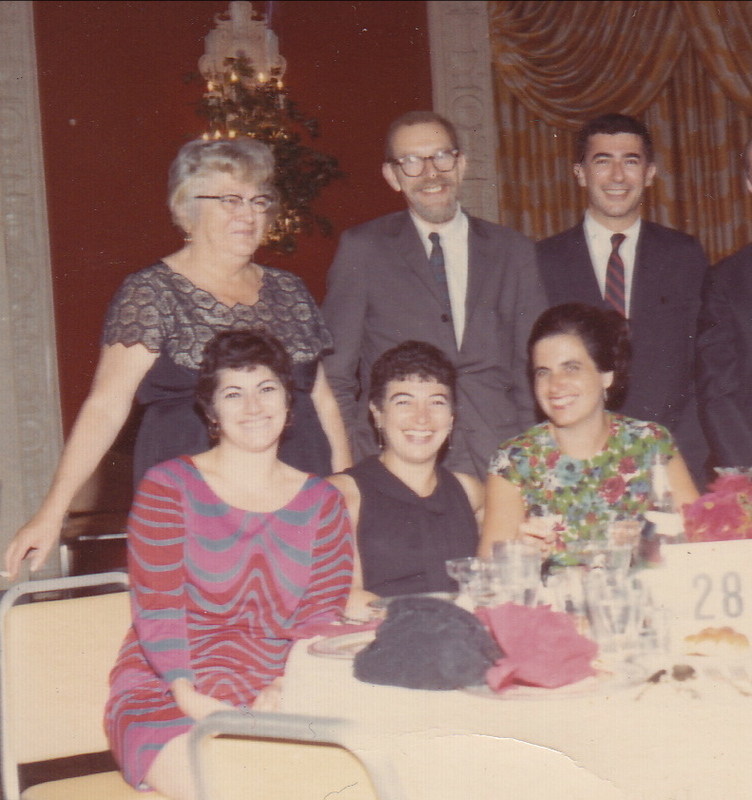 She held a job until 1968 or so, but that was only due to the kindness and generosity of her employer who treated her like family, put up with much mishegoss, and then, finally, couldn't any longer. She was never homeless. A rent controlled apartment was very helpful in that regard. Although during a psychotic break, when she went missing for a week, she was found, finally, living in the bathroom at Penn Station with her life's savings in cash incredibly still stuffed into the pockets of her overcoat. The radio that had been implanted in her head had told her to leave home, go there. The fact that she has made it to this ripe old age is somewhat of a miracle. A miracle combined with the fact that when she is being less crazy (she is never, truly sane, just more and less crazy) her core personality can actually shine through. And Marilyn, the less crazy person? Is all kinds of smart and funny, charming and wonderful, irresistible and charismatic. Also, in her younger days? Quite beautiful. 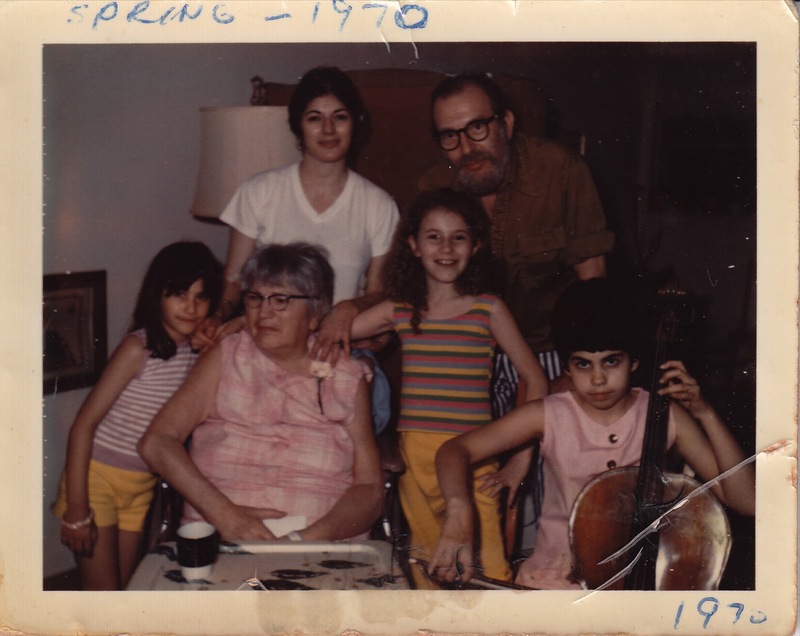 That's Marilyn on the left, with my Mother, Aunt Eva, Grandmother, Father, Uncle Walter. So when she is being her somewhat saner self, Marilyn gets people to care about her, to help her, to take care of her... until she cracks wide open again and acerbically and emphatically pushes everyone away. Paranoia manifested big and bold is no fun at all for anyone, deeply destructive of the self and shredding of all relationships; corrosive acid sprayed in all directions. Which is why I haven't seen her in a dozen or so years. My helping hand has been bitten too many times, I stopped stretching it out. Same with my mother (although she has seen her more recently). She would visit Marilyn, whether in her apartment (while she still had an apartment), or in the hospital (during one of her many psychiatric hospitalizations) bearing gifts aplenty. A few visits would go well, and then the tide would turn, there would be accusations and bitter words, because nothing was ever enough for Marilyn, whatever you generously gave, you were accused of withholding all the rest. There would be attacks, usually verbal, occasionally physical, and my mother would storm off, muttering "The hell with her!" under her breath, tears streaming down her eyes; wounded by and hurting for her beautiful baby sister who had come to this, become this wretched miserable creature. And then some time would pass, sometimes months, sometimes years. And it would start up again. But age is not kind to the mentally ill, and in the past dozen or so years there have been very few periods of lucidity, and our last encounter ended quite horribly. There was violence, we withdrew. And Marilyn finally lost her apartment, entered into a series of nursing homes, and we lost track of her for a while. But she is still family, so when my Uncle Walter, her big brother, called me Sunday night to tell me Marilyn was in the hospital and not doing well, and could I please tell my mother (his big sister) about this, and could we go see her and meet with her doctors? Of course I said yes. Coincidentally, I had been thinking about Marilyn a lot lately. Jacob's new school is in her old neighborhood. On the days when I pick him up, we sit and eat our snack in the square where she hung out, was a regular; one of those people settled in all comfortable on their own personal benches, one of those "crazies" that you avoid because their laugh is a little too close to a cackle, and maybe they don't smell so nice. I've been thinking I should try to find her again, wondering if she were still alive, thinking my mom would be wanting to see her sister about now. And then, Sunday, the call. So today, after going to my mother's apartment and yet again "fixing" her "broken" TV ("Mom, you changed the input again -- just don't touch THAT button, OK?") bringing my mother to the audiologist to pick up her hearing aid (yay!) and having them program it ("Why is everything so loud now?") we headed over to the hospital to visit Marilyn. I was acutely queasy as we walked down the long, long corridor to her room at the end of the ward, my dread growing with each slow step forward. I knew she would be in terrible shape, aged well beyond her years by the hard life she had led. 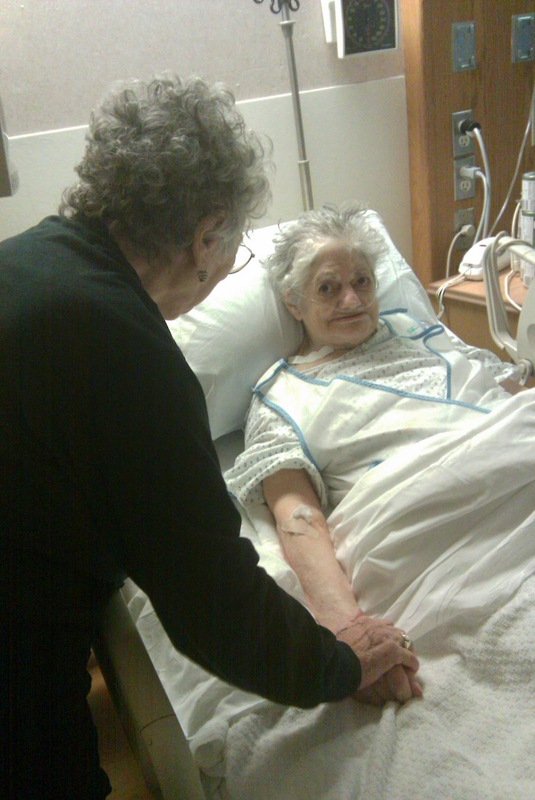 I'd learned she had been hospitalized for a week, transferred from her current nursing home to the ICU with a raging, life threatening UTI gone septic. Infection vanquished, she had remained nearly catatonic, refusing to speak, refusing to eat. Feeding tubes had been put in and were quickly pulled out, rejected. She wanted to be left alone. She wanted to die. We tiptoed into the room, she was indeed looking ragged. My mother started to pass the first bed, head toward the next when I stopped her, recognizing a familiar shape of nose. Asleep when we arrived, I touched her arm to awaken her. She stared, startled, but recognized us. Behind her large eyes, now sunken, the piercing intelligence that has always been there peered out, missing nothing. "Is it cold out?" she asked, noticing our down coats piled on the chair. Her voice was a horse whisper, speech slurred by a complete lack of teeth. We told her we had lost her, but that now found we were here to stay in her life. We took turns holding her hand, stroking her arm. I showed her pictures of my boys. My mother shared with her the death of my father, her brother-in-law. She was clearly glad to see us. But when lunch came she still refused to eat, set in her determination to be done with it all. Or maybe the senior dementia has overtaken her everyday crazy and she has forgotten how to eat. Or maybe she thought they were trying to poison her. In any event, the outcome will be the same, soon. It was, by necessity, a short visit (I had to return home to retrieve a child) but we reassured her we would be back within a few days. Her eyes followed us out of the room. Her doctor arrived just as we were leaving, hurried words exchanged, my promise to return the next day extracted. Sometime soon I will tell more tales of my Aunt Marilyn, of the years of my childhood when she was a regular part of my life, when the "crazy" referenced more of the zany and wacky, the youthful and fun aspects of her personality, and less of the truly meshuggina. Believe it or not, in our family "Crazy Aunt Marilyn" is a term of affection, of acceptance. It's just who she is. And we have always loved her, even in absence, even though when around she often drove us... crazy. Tomorrow I will meet with her "team" at the hospital and we will decide how to move her into palliative, hospice care; how to prepare for her ending. Tomorrow we will plan for the final days of a life that unraveled a long time ago, a life that has been hanging in lonely, stringy tatters for oh, so long. Tomorrow I will again hold the hand of my childlike, wizened Aunt, as she turns her piercing gaze upon me. Tomorrow I will look back through the tunnel of time to see before me the beautiful girl with the big dark eyes who wanted to be a dancer, my mother's baby sister, my "Crazy Aunt", Marilyn. Update: My Aunt actually rallied, did not die, began to accept some nutrients, she will still eat no solid food, but will drink juice and milkshakes. She has since moved back to a nursing home, although she cycles in and out of the hospital every few weeks with some minor crisis. My mother and I visit her regularly, and although she never speaks more than a few words to us, is still deep in her dementia, she knows we are there and it means so much to her. she's lucky to have you. oh wow. wow. this was a very moving tribute to someone who obviously had a profound affect on your life, even though she wasn't always present in your life. powerful writing. Your family is fascinating. It really is, and of course, you are a fabulous story teller. Also, I don't think I've ever read a blog post with "mishegoss" and "meshuggina" in it! What a wonderful tribute you've written to this woman.